Healthy and sustainable lifestyles for all? Zoom in on good practices for sustainable lifestyles and health equity across Europe and shape the future you want to inherit! 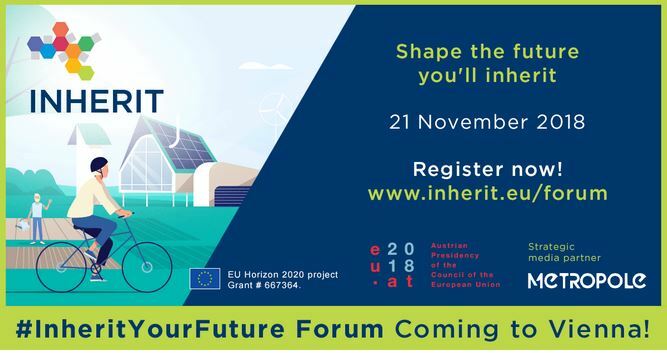 After three years of investigation societal trends and inter-sectoral European practices, the #InheritYourFuture Forum will promote successful practices and introduce four achievable future scenarios for Europe in 2040. We invite you to MuseumsQuartier in Vienna on 21 November 2018. Practice leaders will showcase inspiring examples that successfully benefit health, the environment and equity-achieving the INHERIT triple-win. join discussions on how to transfer and mainstream good practices in the areas of green urban spaces, energy efficient housing, active travel, and food consumption. This interactive event will include keynotes, pitches, breakout and networking opportunities.